Kevin Kelly at Technium: “…The procession of technological discoveries is inevitable. When the conditions are right — when the necessary web of supporting technology needed for every invention is established — then the next adjacent technological step will emerge as if on cue. If inventor X does not produce it, inventor Y will. The invention of the microphone, the laser, the transistor, the steam turbine, the waterwheel, and the discoveries of oxygen, DNA, and Boolean logic, were all inevitable in roughly the period they appeared. However the particular form of the microphone, its exact circuit, or the specific design of the laser, or the particular materials of the transistor, or the dimensions of the steam turbine, or the peculiar notation of the formula, or the specifics of any invention are not inevitable. Rather they will vary quite widely due to the personality of their finder, the resources at hand, the culture of society they are born into, the economics funding the discovery, and the influence of luck and chance. An incandescent light bulb based on a coil of carbonized bamboo filament heated within a vacuum bulb is not inevitable, but “the electric incandescent light bulb” is. The concept of “the electric incandescent light bulb” abstracted from all the details that can vary while still producing the result — luminance from electricity, for instance — is ordained by the technium’s trajectory. We know this because “the electric incandescent light bulb” was invented, re-invented, co-invented, or “first invented” dozens of times. In their book “Edison’s Electric Light: Biography of an Invention”, Robert Friedel and Paul Israel list 23 inventors of incandescent bulbs prior to Edison. It might be fairer to say that Edison was the very last “first” inventor of the electric light. 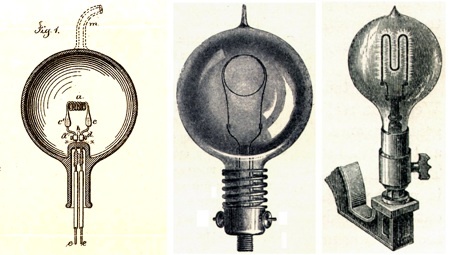 Three independently invented electric light bulbs: Edison’s, Swan’s, and Maxim’s. Any claim of inevitability is difficult to prove. Convincing proof requires re-running a progression more than once and showing that the outcome is the same each time. That no matter what perturbations thrown at the system, it yields an identical result. To claim that the large-scale trajectory of the technium is inevitable would mean demonstrating that if we re-ran history, the same abstracted inventions would arise again, and in roughly the same relative order. Without a time machine, there’ll be no indisputable proof, but we do have three types of evidence that suggest that the paths of technologies are inevitable. They are 1) that quantifiable trajectories of progress don’t waver despite attempts to shift them (see my Moore’s Law); 2) that in ancient times when transcontinental communication was slow or null, we find independent timelines of technology in different continents converging upon a set order; and 3) the fact that most inventions and discoveries have been made independently by more than one person….(More)”. Book by Carl Benedikt Frey: “From the Industrial Revolution to the age of artificial intelligence, The Technology Trap takes a sweeping look at the history of technological progress and how it has radically shifted the distribution of economic and political power among society’s members. As Carl Benedikt Frey shows, the Industrial Revolution created unprecedented wealth and prosperity over the long run, but the immediate consequences of mechanization were devastating for large swaths of the population. Middle-income jobs withered, wages stagnated, the labor share of income fell, profits surged, and economic inequality skyrocketed. These trends, Frey documents, broadly mirror those in our current age of automation, which began with the Computer Revolution. The Industrial Revolution was a defining moment in history, but few grasped its enormous consequences at the time. The Technology Trap demonstrates that in the midst of another technological revolution, the lessons of the past can help us to more effectively face the present…. (More)”.